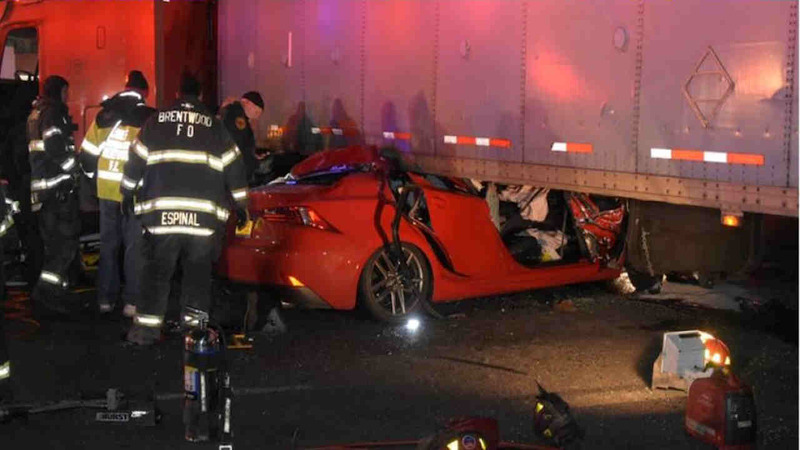 BAY SHORE, Long Island (WABC) -- A wreck on Long Island that left a car carrying two people wedged under a tractor-trailer was one of many traffic accidents in the area Friday morning. The vehicles collided at Fifth and Sweeneydale avenues in Bay Shore around 4:22 a.m. Injuries to the driver and passenger were unknown. The crash closed Fifth Avenue in both directions between Connecticut and New Hampshire avenues. According to the Suffolk County Police Department, Billy David Goodman was eastbound in a 2007 International tractor-trailer on Sweeneydale Avenue and attempted to turn left onto northbound Fifth Avenue. A southbound 2016 Lexus ran into him. The two people in the Lexus had to be extricated from the car, which was pinned underneath the tractor-trailer. They were taken to Southside Hospital in Bay Shore for serious injuries. Goodman, 57, of Arkansas, was not injured. The cause of the wreck is unclear. Several accidents and closures were reported in Eastern Suffolk County Friday morning. Southampton Town Police said there were 17 wrecks caused by black ice over an eight-hour span starting at 1:30 a.m. Friday. In Bridgehampton, an SUV lost control at 6:55 a.m. on Montauk Highway and slammed head-on into a Suffolk Transit Bus. The driver of the SUV was pronounced dead at the scene. Montauk Highway remained closed at the scene. There were no passengers on the bus. The driver of the S92 transit bus was taken to Southampton Hospital. Around the same time, a driver lost control of a car on Route 51 in Northampton and crashed into a tree. The driver was airlifted to Stony Brook University Hospital by a Suffolk County Police Department helicopter where he's listed in serious condition. The road has reopened here. Following another accident, Route 48 at Aldrich Lane in Mattituck was closed; and a car skidded on black ice and hit a guardrail, closing Route 105 in Riverhead. Route 24 was closed by a downed tree and icy conditions at Birch Creek Road in Flanders.